Perth (/ˈpɜːrθ/ ( listen); Scottish Gaelic: Peairt [ˈpʰɛuɾt̪]) is a city in central Scotland, on the banks of the River Tay. 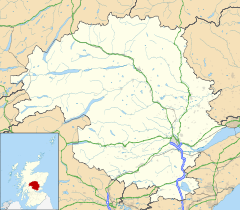 It is the administrative centre of Perth and Kinross council area and the historic county town of Perthshire. It has a population of about 47,180. Perth has been known as The Fair City since the publication of the story Fair Maid of Perth by Scottish writer Sir Walter Scott in 1828. During the later medieval period the city was also called St John's Toun or Saint Johnstoun by its inhabitants in reference to the main church dedicated to St John the Baptist. This name is preserved by the city's football teams, St Johnstone F.C. Today, Perth serves as a retail centre for the surrounding area. Following the decline of the whisky industry locally, the city's economy has now diversified to include insurance and banking. Due to its location, the city is often referred to as the "Gateway to the Highlands". The name Perth derives from a Pictish word for wood or copse. During much of the later medieval period it was known colloquially by its Scots-speaking inhabitants as "St John's Toun" or "Saint Johnstoun" because the church at the centre of the parish was dedicated to St John the Baptist. Perth was referred to as "St Johns ton" up until the mid-1600s with the name "Perthia" being reserved for the wider area. At this time, "Perthia" became "Perth Shyre" and "St Johns ton" became known as Perth. Perth's Pictish name, and some archaeological evidence, indicate that there must have been a settlement here from earlier times, probably at a point where a river crossing or crossings coincided with a slightly raised natural mound on the west bank of the Tay (which at Perth flows north-south), thus giving some protection for settlement from the frequent flooding. Finds in and around Perth show that it was occupied by the Mesolithic hunter-gatherers who arrived in the area more than 8,000 years ago. Nearby Neolithic standing stones and circles followed the introduction of farming from about 4000 BC, and a remarkably well preserved Bronze age log boat dated to around 1000 BC was found in the mudflats of the River Tay at Carpow to the east of Perth. The presence of Scone two miles (3 km) northeast, the main royal centre of the Kingdom of Alba from at least the reign of Kenneth I mac Ailpín (843–58), later the site of the major Augustinian abbey of the same name founded by Alexander I (1107–24), enhanced Perth's early importance. Perth was considered the effective 'capital' of Scotland, due to the frequent residence of the royal court. Royal Burgh status was soon awarded to the city from King William the Lion in the early 12th century. During the 12th and 13th centuries, Perth was one of the richest trading burghs in the kingdom (along with such places as Berwick-upon-Tweed, Aberdeen and Roxburgh), residence of numerous craftsmen, organised into guilds (e.g. the Hammermen [metalworkers] or Glovers). Perth also carried out an extensive trade with France, The Low Countries and the Baltic Countries with luxury goods being brought back in return, such as Spanish silk and French pottery and wine. The royal castle (on or near the site of the present multi-storey car park adjacent to the new council offices), was destroyed by a flood of the Tay in 1209, one of many that have afflicted Perth over the centuries. It was never rebuilt and Perth was protected at this time only by partial walls and an inventive water system consisting of a Mill lade from the River Almond which divided and flowed to the North on one side and the West and South on the other, eventually joining the Tay. King Edward I brought his armies to Perth in 1296 and with only a ditch for defence and little fortification, the city fell quickly. Stronger fortifications were quickly implemented by the English, and plans to wall the city took shape in 1304. They remained standing until Robert the Bruce's recapture of Perth in 1312. As part of a plan to make Perth a permanent English base within Scotland, Edward III forced six monasteries in Perthshire and Fife to pay for the construction of stone defensive walls, towers and fortified gates around the city in 1336. These defences were the strongest of any city in Scotland in the Middle Ages. King James I of Scotland was assassinated in Perth in 1437, by followers of the Earl of Atholl at Blackfriars church. In May 1559, John Knox instigated the Scottish Reformation at grass-roots level with a sermon against 'idolatry' in the burgh kirk of St John the Baptist. An inflamed mob quickly destroyed the altars in the kirk, and attacked the Houses of the Greyfriars and Blackfriars, and the Carthusian Priory. Scone Abbey was sacked shortly afterwards. The regent of infant Mary, Queen of Scots, her mother Marie de Guise, was successful in quelling the rioting but presbyterianism in Perth remained strong. Perth played a part in the Covenanting struggle and Perth was sacked for two days by Royalist troops after the Battle of Tippermuir in 1644. In 1651, Charles II was crowned at nearby Scone, traditional site of the investiture of Kings of Scots. That same year Oliver Cromwell came to Perth following his victory in the Battle of Dunbar and established a fortified citadel on the South Inch, one of five occupation forts built to control Scotland. The restoration of Charles II was not without incident, and with the Act of Settlement in 1701, came the Jacobite uprisings. The city was occupied by Jacobite soldiers in 1689, 1715 and 1745. In 1760, Perth Academy was founded, and major industry came to the city, now with a population of 15,000. Linen, leather, bleached products and whisky were its major exports. Given its location, Perth was perfectly placed to become a key transport centre with the coming of the railways. The first railway station in Perth was built in 1848. Horse-drawn carriages became popular in the 1890s; they were quickly replaced by electric trams of Perth Corporation Tramways. Despite being a garrison city and undergoing major social and industrial developments during the First World War, Perth remained relatively unchanged. In 1829, with the settlement of the Swan River Colony, in Western Australia, Sir George Murray wanted it to be named Perth after the place where he was born. Today, Perth serves as a retail centre for the surrounding area. This includes a main shopping centre along with a pedestrianised high street and many independent and specialist shops. Main employers in the city now include Aviva, Royal Bank of Scotland and Scottish and Southern Energy. The coat of arms of Perth is: Gules a Paschal lamb reguardant argent haloed or holding under its right foreleg a flagpole topped with a cross of the second, to which is attached a banner azure a saltire argent, all within a tressure flory-counter-flory of the last. The shield is supported by a double-headed eagle or, and the motto is PRO REGE, LEGE ET GREGE (Latin: For the King, the Law and the People). The coat of arms dates back to at least the 14th century, and is first recorded, as described, on a seal of 1378. Red and silver are the colours of John the Baptist, the town's patron saint, and the lamb is his symbol. The double-headed eagle, originally a Roman symbol, may refer to a former Roman settlement called "Bertha" near where Perth now stands. 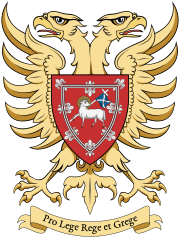 The double-headed eagle was adopted as the supporter of the arms of Perth and Kinross when that council area was created in 1975. Perth forms part of the county constituency of Perth and North Perthshire, electing one Member of Parliament (MP) to the House of Commons of the Parliament of the United Kingdom by the first past the post system. Pete Wishart (SNP) is the MP for Perth and North Perthshire. For the purposes of the Scottish Parliament, Perth forms part of the constituencies of Perthshire North and Perthshire South and Kinross-shire. These two constituencies were created in 2011 as two of the nine constituencies within the Mid Scotland and Fife electoral region. Each constituency elects one Member of the Scottish Parliament (MSP) by the first past the post system of election, and the region elects seven additional members to produce a form of proportional representation. Perthshire North is currently represented by John Swinney (SNP) and Perthshire South and Kinross-shire is currently represented by Roseanna Cunningham (SNP). At EU level, Perth is part of the pan-Scotland European Parliament constituency which elects seven Members of the European Parliament (MEP)s using the d'Hondt method of party-list proportional representation. Currently, Scotland returns two SNP, two Labour one Conservative and one UKIP MEP to the European Parliament. Signage in Perth using the term 'city' prior to the reinstatement of city status. The classic definition of Perth has been as a city, and traditional documentation confirms that this has been true since time immemorial. In the late-1990s, the UK Government and the devolved Scottish Executive re-examined the definition of a city and produced a list of approved cities, from which Perth was omitted. It was therefore considered to be a "former city", like Brechin and Elgin. Despite this, road signs around the borders used the term "The City of Perth", and directional signs within indicated "City Centre". In June 2007, Alex Salmond, the-then First Minister of Scotland, backed a campaign to confer city status on Perth, saying it should be granted "at the next commemorative opportunity". The local authority, Perth and Kinross, stated that the octennial anniversary of the city in 2009 should create "a foundation for Perth to bid for formal city status". Perth was one of the 26 bidders for city status to mark the Queen's Diamond Jubilee in 2012. On 14 March 2012, Perth's city status was successfully reinstated. It became Scotland's seventh city. The Queen visited Perth on 6 July 2012, for what was the culmination of the Scottish leg of her Diamond Jubilee tour. Her previous visit to the city had been to officially open the Perth Concert Hall, in 2005. According to the 2001 UK Census, Perth had a total population of 43,450. A more recent population estimate of the city has been recorded as 44,820 in 2008. The demographic make-up of the population is much in line with the rest of Scotland. The age group from 30–44 forms the largest portion of the population (22%). The median age of males and females living in Perth was 37 and 40 years respectively, compared to 37 and 39 years for those in the whole of Scotland. The place of birth of the city's residents was 95.42% United Kingdom (including 87.80% from Scotland), 0.52% Republic of Ireland, 1.18% from other European Union countries, and 1.88% from elsewhere in the world. The economic activity of residents aged 16–74 was 57.10% in full-time employment, 12.90% in part-time employment, 6.08% self-employed, 3.29% unemployed, 2.37% students with jobs, 2.84% students without jobs, 14.75% retired, 4.93% looking after home or family, 5.94% permanently sick or disabled, and 4.07% economically inactive for other reasons. Compared with the average demography of Scotland, Perth has low proportions of people born outside the European Union, but has both higher proportions born within the European Union and those over 75 years old. As with most of the British Isles and Scotland, Perth has an oceanic climate (Köppen Cfb) with cool summers and mild winters. The nearest Met Office weather station is at Strathallan. around 5 mi (8 km) from the centre of Perth. Perth is one of the mildest places in Scotland. Temperatures extremes since 1960 have ranged from −18.6 °C (−1 °F) in January 1963 to 31.4 °C (89 °F) in July 1995. However, a temperature of −21.7 °C (−7 °F) was recorded on 14 November 1919. As well as this, the temperature reached 31.1 °C (88.0 °F) on 28 June 2018. The coldest temperature recorded in recent years is −17.8 °C (0 °F) in December 2010. In an average year, the warmest day rises to around 27 °C (81 °F), and about four days exceed 25 °C (77 °F). The strength of Perth's economy lies in its diversity, with a balance of large companies, the public sector, a broad range of small and medium-sized enterprises and many self-employed business people. The development in renewable energy, insurance, manufacturing, leisure, health and transport is stimulating employment. The largest employer in the city is Perth and Kinross Council which employ 6,000 people. Other main employers include NHS Tayside, Scottish and Southern Energy, and Perth College UHI (part of the University of the Highlands and Islands). The leading international transportation company, Stagecoach Group also has its global headquarters in the city. Perth was formerly headquarters of insurance firm General Accident. However, when General Accident merged with Norwich Union to form Aviva the office has been primarily used as a call centre. Perth's city centre is situated to the west of the banks of the River Tay. The pedestrianised portion of the High Street, which runs from the junction of St John Street to Scott Street, is the main focus of the shopping area. The centre has a variety of major and independent retailers. The major retailers are largely based on the High Street, St John Street and the St John's Centre. Independent retailers can be found on George Street, the Old High Street and Canal Street. A£3 million pound project for the High Street and King Edward Street provided new seating, lighting and the laying of natural stone in 2010. A retail park, constructed in 1988, exists to the north-west of the city centre on St Catherine's Road, and provides eight purpose built units. Before the credit crisis, Perth's economy was growing at 2.6% per year, considerably above the Scottish average of 2.1%. Since the credit crisis, growth has slowed considerably though still remained above the Scottish average. The Perth economy is ranked in the Top 10 enterprising demographics in Scotland, with an average of 42.6 registered enterprises per 10,000 residents putting it well above the Scottish average of 30.1. Perth Museum and Art Gallery at the top end of George Street is recognised as one of the oldest provincial museums in Scotland. Another museum known as the Fergusson Gallery is in the former Perth Waterworks building on Tay Street. This contains the major collection of the works of the artist John Duncan Fergusson. Perth Theatre, which opened in 1900, is one of Scotland's oldest and most historic repertory theatres. [better source needed] It is undergoing a £10 million redevelopment to house new studio space, a youth theatre, construction workshop and a series of front of house performance areas and new main entrance from Mill Street in addition to the main focus of the conservation and restoration of the historic Victorian auditorium.Perth Concert Hall which opened in 2005, was built on the site of the former Horsecross Market and largely funded from Britain's millennium celebrations. Perth City Hall has been used as a venue for several high-profile concerts over the years, including Morrissey, as well as Conservative Party conferences. The hall is currently disused while proposals are considered for its future. The new wave band Fiction Factory had some success with their hit "(Feels Like) Heaven" in 1984. The song, which reached number six in the charts, would be their biggest hit, and Perth's biggest to date. The Perth Festival of the Arts is an annual collection of art, theatre, opera and classical music events in the city. The annual event lasts for a couple of weeks and is usually held in May. In recent years, the festival has broadened its appeal by adding comedy, rock and popular music acts to the bill. Perth also has a number of twin cities around the world. These are: Aschaffenburg in Germany, Bydgoszcz in Poland, Haikou, Hainan in China, Perth in Australia, Perth (Ontario) in Canada, Pskov in Russia and Cognac in France. Perth is noted for its lively nightlife, with dozens of bars and several nightclubs. The sole newspaper based in the city is the Perthshire Advertiser, owned by Trinity Mirror. The newspaper's offices are based in Watergate, but the newspaper itself is printed in Blantyre. There is also one local radio in the city – Heartland FM – which broadcasts 24 hours a day to Perthshire from its base in Pitlochry. One of Britain's most successful radio stations, Hospital Radio Perth, broadcasts to Perth Royal Infirmary and Murray Royal Hospital. The Hospital Broadcasting Association have awarded Hospital Radio Perth the title of "British Station of the Year" in 1996, 1997, 1999 and 2007. Perth has hosted the National Mòd in 1896, 1900, 1924, 1929, 1947, 1954, 1963, 1980 and 2004. Perth has 79 tourist attractions listed on the site TripAdvisor. The Category A listed St John's Kirk on South St John's Place is architecturally and historically one of the most significant buildings in Perth. The settlement of the original church dates back to the mid-12th century. During the middle of the 12th century, the church was allowed to fall into disrepair, when most of the revenues were used by David I to fund Dunfermline Abbey. The majority of the present church was constructed between 1440 and 1500. Though much altered, its tower and lead-clad spire continue to dominate the Perth skyline. The Church has lost its medieval south porch and sacristy, and the north transept was shortened during the course of the 19th century during street-widening. A rare treasure, a unique survival in Scotland, is a 15th-century brass candelabrum, imported from the Low Countries. The survival of this object is all the more remarkable as it includes a statuette of the Virgin Mary. St John's Kirk also had the finest collection of post-Reformation church plate in Scotland (now housed permanently in Perth Museum and Art Gallery). Equally remarkably, the collection of medieval bells is the largest to have survived in Great Britain. The spire of Category B listed St Paul's Church, which was completed in 1807 is a major focus point around St Paul's Square at the junction of Old High Street and North Methven Street. The development of the church led to an expansion of the city to the west. Pullar House on Mill Street was once used by Pullar's dyeworks, the largest industry in Perth at one time and has since been converted into office use for Perth and Kinross Council in 2000. The Category A listed Fair Maid's House on North Port is the oldest surviving secular building in Perth. Built on the foundations of previous buildings, parts of the structure date back from 1475. Purchased by the Glovers Association in 1693 for use as a meeting house, the house was reconstructed in 1893 to its current appearance. This was used as the home of Catherine Glover in the novel, The Fair Maid of Perth which was written by Sir Walter Scott in 1828. In 2010, the house was converted by the Royal Scottish Geographical Society (RSGS) into a visitor and educational centre reflecting the history of Perth. 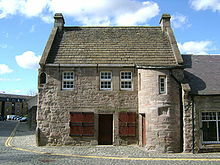 The work also included the extension of a building between the Fair Maid's House and the neighbouring Lord John Murray's House from which the RSGS have operated their headquarters, when it moved to Perth in 2008. The Scottish Government awarded funding of £450,000 to aid the project, while the other £350,000 was provided by the RSGS themselves. The sensitive conversion of the building was recognised by the Perth Civic Trust, winning its restoration and renovation award in 2011. The nearby City Mills built to serve the lade from the River Almond was once the site of industry until the early 19th century. Only the Upper and Lower Mills survive to this day. The Category A listed Lower Mills which date from 1805 were used for barley and oatmeal, while the Category A listed Upper Mills of 1792 consisted of two wheat mills connected to a granary. The Category A listed former Perth Waterworks completed in 1832, serve as the main focus point on the southern end of the city centre. The waterworks, which have been converted into a gallery dedicated to the works of J.D. Fergusson in 1992, is one of the very few early surviving examples of a cast iron structure. View from the West (Main) Stand of McDiarmid Park, home of St Johnstone F.C. St Johnstone is the city's professional football club. The team play in the Scottish Premiership at their home ground, McDiarmid Park, in the Tulloch area of the city. They were the Scottish Cup holders having won it for the first time in 2014, after 130 years without a major trophy. There are also two junior clubs also based in Perth – Jeanfield Swifts and Kinnoull. The senior rugby team, Perthshire Rugby Football Club, play their games on the North Inch in the Scottish Championship League B. Between 1995 and 1998 the professional Caledonia Reds played some of their home matches in Perth at McDiarmid Park before they merged with Glasgow Warriors. Perth Leisure Pool, to the west of the railway station on the Glasgow Road, is the city's swimming centre. The modern leisure pool complex was built in the mid-1980s to replace the traditional public swimming baths (established 1887) which used to sit just off the Dunkeld Road. There is a large sports complex, Bell's Sports Centre, to the northwest of the city centre, at the western edge of the North Inch. Prior to the building of the Greenwich Dome, it was the largest domed building in Britain. Perth hosts Scotland's largest volleyball event every May – the Scottish Open Volleyball Tournament. There is a highly competitive indoor competition held inside Bell's Sports Centre alongside both a competitive and fun outdoor event played on the North Inch. Teams competing traditionally camp alongside the outdoor courts with the campsite being administered by local cadets. The Scottish Volleyball Association's annual general meeting is also held at the same time as tournament. The Dewar's Centre, which includes an eight-lane ice rink, has long been a main centre of curling in Scotland. Many top teams compete in this arena and many major events are held here each year. Curling is available from September to April annually. There is an indoor bowling hall, hosting major competitions. Historically Perth had a successful ice hockey team, Perth Panthers, who played at the old ice rink on Dunkeld Road. The rink at Dewars is the wrong shape for ice hockey, so when the team reformed in 2000 for two seasons they played their home games at Dundee Ice Arena. Perth is also home to two main parks, namely the North Inch and South Inch (the word "Inch" being an anglicisation of the Gaelic innis meaning island or meadow). The Inches were given to the city in 1377 by King Robert III. The North Inch is directly north of the city centre. It is bordered to the south by Charlotte Street and Atholl Street and to the southwest by Rose Terrace. Its western perimeter consists of part of the exercise path that circumnavigates the entire park. The River Tay bounds it to the east. A little farther to the north is the Inch's eponymous golf course. Situated 1⁄2 mile (800 m) south of the North Inch, directly across the city centre, is the South Inch. The Inches are linked by Tay Street, which runs along the western banks of the Tay. The South Inch is bordered to the north by Marshall Place and Kings Place; to the east by Shore Road; to the south by South Inch View; and to the west by St Leonards Bridge. The Edinburgh Road passes through its eastern third. The South Inch offers various activities, including bowling, an adventure playground, a skate park, and, in the summer, a bouncy castle. The Perth Show takes place annually on the section of the Inch between the Edinburgh Road and Shore Road. There are many primary schools in Perth, while secondary education includes Perth Academy, Perth Grammar School, Perth High School and St John's Academy. Further and higher education, including a range of degrees, is available through Perth College UHI, one of the largest partners in the University of the Highlands and Islands. It runs a network of learning centres across the area, in Blairgowrie, Crieff, Kinross and Pathways in Perth. It also owns AST (Air Service Training) which delivers a range of aircraft engineering courses. Perth is home to a Sheriff Court, in a listed building on the banks of the river Tay. The building was designed by London architect Sir Robert Smirke, built in 1819 and stands on the site of Gowrie House, the place where a plot to kill King James VI was hatched in 1600. Perth is also home to a large prison, HM Prison Perth. Perth remains a key transport hub for journeys by road and rail throughout Scotland. The M90 motorway runs south from the city to Edinburgh; the A9 road connects it to Stirling and Glasgow in the south west and Inverness in the north. Other major roads serving the city include the A85 to Crieff and Crianlarich (and ultimately Oban), the A93 to Blairgowrie and Braemar, the A94 to Coupar Angus and Forfar and the A90 to Dundee and Aberdeen. The city itself was bypassed to the south and east by the M90 in the 1970s and to the west by the A9 in the 1980s. The M90, A9 and A93 all meet at Broxden Junction, one of the busiest and most important road junctions in Scotland. Uniquely, all of Scotland's other six cities are signposted from here: Glasgow and Stirling via the A9 southbound, Dundee and Aberdeen via the A90, Edinburgh via the M90, and Inverness via the A9 northbound. The final part of the M90 included the construction of the Friarton Bridge in 1978 to facilitate travel to Dundee and Aberdeen to the east of the city, finally removing inter-city traffic from the centre. The bridge is the most northerly piece of the motorway network in the United Kingdom. There are four bridges that cross the River Tay in Perth. The northernmost structure is Smeaton's Bridge (also known as Perth Bridge and, locally, the Old Bridge), completed in 1771 and widened in 1869, which carries the automotive and pedestrian traffic of West Bridge Street (the A85). Eastbound vehicles are not permitted to make a right turn onto Bridgend's Gowrie Street. Next, some five hundred yards downstream, is Queen's Bridge, which also carries vehicle and pedestrian traffic, this time of South Street and Tay Street. Queen's Bridge was completed in 1960, replacing the old Victoria Bridge (1902–1960), and was opened by Queen Elizabeth II in October of that year. The third bridge in the centre of Perth is a railway bridge, carrying trains to and from the railway station, 1⁄2 mile (800 m) to the north-west. It was completed in 1863. There is also a pedestrian walkway on its northern side. Finally, the southernmost crossing of the Tay inside Perth's boundary is the aforementioned Friarton Bridge. The construction of a fifth bridge farther upstream (north) from the existing bridges is being considered. Perth railway station has regular services to Fife, Edinburgh Waverley via the Forth Bridge, east to Dundee and Aberdeen, south to Stirling and Glasgow Queen Street, and north to Inverness. However, as a result of the Beeching Axe, the main line to Aberdeen through Strathmore via Coupar Angus and Forfar was closed to passenger traffic in 1967; Aberdeen services have since taken the less direct route via Dundee. Similarly, the direct main line to Edinburgh via Glenfarg, Dunfermline and the Forth Bridge was abandoned in 1970 in favour of the longer, more circuitous route via Stirling. This closure was not recommended by Beeching, but allowed the M90 motorway to be built on top of the former the railway alignment in the Glenfarg area. In 1975, most Edinburgh trains were re-routed via Ladybank and the Forth Bridge, with some improvement in journey time. There are two direct trains per day to London, the Highland Chieftain operated by London North Eastern Railway to King's Cross (from Inverness), while the Caledonian Sleeper runs overnight to Euston. Local buses are run by Stagecoach East Scotland. Inter-city bus travel is made from Leonard Street bus station and connects to most major destinations in Scotland. The budget Megabus service is centred on Broxden Junction (2 1⁄4 mi or 3.6 km outside the city centre) and runs direct buses to Scotland's largest cities plus Manchester and London in England. In addition, there is a park and ride service from the services at Broxden to the city centre. Perth has a small airport; Perth Airport is located at New Scone, 6 km (3.7 mi) north-east of Perth. There are no commercial flights out of this airport, but it is used by private aircraft and for pilot training. The nearest major commercial airports are Edinburgh Airport, Glasgow Airport and Aberdeen Airport. Dundee Airport, which is a 20 minute drive from Perth, offers flights to London Stansted Airport as well as charter, engineering and training facilities. William of Perth (12th Century), Scottish saint who was martyred in England, was born and lived in Perth. Andrew Fairlie (chef), (1963–2019), Scottish Chef known for Restaurant Andrew Fairlie. Sir George Murray, MP for Perthshire 1824–1832 and 1834–1835, Secretary of State for War and the Colonies 1828–1830 and Master-General of the Ordnance 1834–1835 and 1841–1846. Murray House, Hong Kong and the Murray River, Australia were named after him and the city of Perth, Western Australia, after his birth place. ^ Andy Eagle (27 February 2003). "Leaf through the Online Scots Dictionary". Scots-online.org. Retrieved 2 October 2013. ^ "Perth (Perth and Kinross, Scotland, United Kingdom) - Population Statistics, Charts, Map, Location, Weather and Web Information". www.citypopulation.info. Retrieved 28 March 2019. ^ a b "Mid-2012 Populations Estimates for Settlements and Localities in Scotland". Archived from the original on 27 October 2014. Retrieved 28 November 2014. ^ "Ainmean-Àite na h-Alba – Gaelic Place-Names of Scotland – Database". Gaelicplacenames.org. Retrieved 2 October 2013. ^ "Perth – gateway to the highlands – Picture of Perth, Perth and Kinross". TripAdvisor. 25 September 2011. Retrieved 2 October 2013. ^ Mills, David (20 October 2011). A Dictionary of British Place-Names. OUP Oxford. p. 366. ISBN 978-0-19-960908-6. Retrieved 22 October 2018. ^ a b Scotiae provintiae inter Taum Fluvium, et Septentrionales oras Angliae (Map). Cartography by Jan Jansson. Jansson, 1659. Retrieved 1 July 2012. ^ Hutton, Guthrie (2005). Bygone Perth. Catrine, Ayrshire: Stenlake Publishing. pp. 3–4. ISBN 9781840333527. ^ Brown, "James I (1394–1437)". ^ Graham, Roderick (2013). John Knox: Man of Action. St Andrew Press. p. 144. ISBN 9780861537150. ^ Bell, W. F. (1926). "South Perthshire and the covenanting struggle". Scottish Church History Society: 57–64. Retrieved 25 August 2018. ^ a b c d e f g h i j "Perth City Centre Conservation Area Appraisal" (PDF). Perth and Kinross Council. Archived from the original (PDF) on 18 July 2011. Retrieved 22 December 2009. ^ a b Urquhart, R.M. (1973). Scottish Burgh and County Heraldry. London: Heraldry Today. pp. 108–109. ISBN 978-0900455247. ^ "Pete Wishart MP". UK Parliament. Retrieved 27 May 2015. ^ "John Swinney MSP". The Scottish Parliament. Retrieved 27 May 2015. ^ "Roseanna Cunningham MSP". The Scottish Parliament. Retrieved 27 May 2015. ^ a b "Scotland (European Parliament Constituency)". BBC News. Retrieved 27 May 2015. ^ "Review of Scotland's Cities – The Analysis". Scottish Government. January 2003. Retrieved 14 May 2010. ^ "Salmond backs bid for city status". BBC News. 7 June 2007. Retrieved 14 May 2010. ^ "800th Anniversary of Perth". Perth and Kinross Council. 29 May 2009. Archived from the original on 17 August 2010. Retrieved 30 August 2010. ^ Clegg, David (14 March 2012). "Perth gets back its city status". The Courier. p. 1. ^ "Perth wins Diamond Jubilee contest to be named seventh Scottish city". BBC News. BBC News (Tayside and Central Scotland). 14 March 2012. Retrieved 27 March 2012. ^ a b c d "Comparative Population: Perth Locality Scotland". scrol.co.uk. 2001. Archived from the original on 4 April 2012. Retrieved 4 June 2010. ^ "Comparative Population: Perth & Kinross Council Area". scrol.gov.uk. 2001. Archived from the original on 4 April 2012. Retrieved 4 June 2010. ^ "Comparative Employment Profile: Perth Locality Scotland". scrol.gov.uk. 2001. Archived from the original on 4 April 2012. Retrieved 4 June 2010. ^ "Comparative Employment Profile: Perth & Kinross Locality Scotland". scrol.gov.uk. 2001. Archived from the original on 4 April 2012. Retrieved 4 June 2010. ^ "Mid-2008 Population Estimates – Localities in order of size". General Register for Scotland. 2008. Archived from the original on 2 July 2010. Retrieved 11 September 2010. ^ "Weatherbase: Perth, Scotland Records and Averages". Weatherbase. Retrieved 22 November 2011. ^ "Perth climate information". Met Office. Retrieved 11 September 2016. ^ Perth and Kinross Council, The Fair City of Perth – An application for City Status, p.19. ^ a b "Perth City Centre Map". Visitscotland. Retrieved 22 December 2009. ^ "Perth shopping streets get £3 million makeover". The Courier. 18 February 2011. Archived from the original on 20 February 2011. Retrieved 18 February 2011. ^ "Perth: St Catherine's Retail Park". Pradera. Archived from the original on 15 July 2011. Retrieved 6 March 2011. ^ "Economic Profile". Invest in Perth. 15 July 2013. Archived from the original on 4 October 2013. Retrieved 2 October 2013. ^ "Theatres in Perth, Scotland". www.arthurlloyd.co.uk. ^ "Perth Theatre". charcoalblue. Archived from the original on 8 July 2011. Retrieved 7 March 2011. ^ "Morrissey Concert Setlist at City Hall, Perth on September 3, 2004". setlist.fm. Retrieved 2 October 2013. ^ "Speech to Scottish Conservative Party Conference | Margaret Thatcher Foundation". Margaretthatcher.org. Retrieved 2 October 2013. ^ "Crunch time in bid to save Perth City Hall – Perth & Kinross / Local / News / The Courier". Thecourier.co.uk. 25 April 2013. Retrieved 2 October 2013. ^ "Perth Nightlife – Clubs, Bars & Nightlife Tips". Virtualtourist.com. Retrieved 2 October 2013. ^ "Perthshire Advertiser". Media UK. Retrieved 24 December 2009. ^ "Perth Royal Infirmary" (PDF). NHS Tayside. Retrieved 24 December 2009. ^ "Hospital Radio Perth". Hospital Radio Perth. Retrieved 24 December 2009. ^ "St John's Kirk, Perth – Listed Building Report". Historic Scotland. Retrieved 29 September 2011. ^ Walker and Ritchie Fife, Perthshire and Angus p. 122. ^ "St Paul's Church, Perth – Listed Building Report". Historic Scotland. Retrieved 29 September 2011. ^ "Fair Maid's House, Perth – Listed Building Report". Historic Scotland. Retrieved 29 September 2011. ^ a b Fothergill, Hendry and Hartley, Walks Around Historic Perth, p.19. ^ a b c d "Revamp for Perth's oldest house". BBC News. 18 September 2011. Retrieved 15 January 2010. ^ Reoch, Paul (10 August 2011). "Perth Civic Trust presents restoration and renovation award to Fair Maid's House". The Courier. Archived from the original on 19 October 2012. Retrieved 18 September 2011. ^ "Lower City Mills, Perth – Listed Building Report". Historic Scotland. Retrieved 29 September 2011. ^ "Upper City Mills, Perth – Listed Building Report". Historic Scotland. Retrieved 29 September 2011. ^ "Former Perth Waterworks, Perth – Listed Building Report". Historic Scotland. Retrieved 29 September 2011. ^ "Clubs in the Scottish Premier League". BBC Sport. 19 January 2011. ^ "list of Scottish Junior football teams A-K". Scottish Football Junior Football Association. Archived from the original on 12 May 2008. Retrieved 17 December 2009. ^ "All RBS Leagues fixtures 2012/13". Scottish Rugby. 1 July 2012. Archived from the original on 23 June 2012. ^ Smith, Gavin & Ruth (2000). Perth in Old Photographs. Sutton Publishing Limited. p. 105. ^ "North Inch golf course – Perth & Kinross Council". Pkc.gov.uk. 17 December 2012. Archived from the original on 5 October 2013. Retrieved 2 October 2013. ^ "Location information". Scotcourts.gov.uk. Retrieved 2 October 2013. ^ a b Graham-Campbell Perth: The Fair City 1994, p. 139. ^ "The Courier – Businessman proposes new 'bridge tax' to get Perth moving". 4 August 2012.